Carmen…its a name that can only conjure one thing: Bizet’s masterpiece and the story of opera’s most fascinating heroines, the Spanish gypsy Carmen. I have had the opportunity of playing her on three separate occasions, and my own experience in trying to find her essence and personal truth has always raised interesting questions for me. In my search for Carmen throughout the years, I became a huge fan of the Carlos Saura film “Carmen”, which portrays Spanish dancer and choreographer Antonio Gades’ search for an elusive muse/dancer to incarnate his new ballet. I was also attracted to Agnes Baltsa’s atavistic and precocious teenager version for the MET Opera. Other sources of inspiration have included the Maria Callas recording, as well as the Teresa Berganza’s recording, which I admire for her preciseness and direct approach, as well as Abbados’ beautiful conducting, making almost chamber music of many of the musical details of Bizet’s score. Tenor Antonio Magno and myself in a production of Carmen in Madrid a few years back. My big question this time around, now that I’m comparing Carmen to Lulu, is the following: Are we attracted to these two characters because they both somehow escaped society’s instructions to be “good”? Not mothers nor wives, and not really providing companionship to the men in their lives (the sexual obsession the men exhibit for their respective female characters is painful to observe, it certainly doesn’t feel like a pleasant state for them), both characters live outside of societies mores. They are simultaneously both good AND bad. I was offended once when someone called “Carmen” a bad woman. I felt Carmen had a heart; I’m not so sure anymore. As a young singer in New York City, I received the opportunity to act in a small concert at the Thalia Theater in the borough of Queens, in New York City. The concert consisted of pieces from Spain’s operetta genre, called “zarzuela“. Not knowing anything about zarzuela, I began researching and more than anything, listening to singers from Spain that sang zarzuela. I found discs by Teresa Berganza (Zarzuela castiza released by Ensayo label being one of my all time favorites), Placido Domingo, Alfredo Krauss and Pilar Lorengar. But the album that I listened to most was the Victoria de los Angeles EMI release disc of zarzuela arias, containing all the principle pieces for female voice in the zarzuela genre, introduced to me by the pianist Pablo Zinger. It was around this time that I became fascinated with the great Catalan mezzo soprano, Conchita Supervia. Thank goodness for the compact disc label “Pearl” with all her Odeon cylinder releases! Conchita had done a prodigious amount of recordings, including versions of Strauss’ Der Rosenkavalier in Italian, Samson and Delilah, all the major scenes from Bizet’s Carmen. She is credited as one of the first interpreters of the 20th century Rossini revival, in that she sang the role of Rosina in Il barbiere di Siviglia in the original mezzo soprano key. Conchita was an active recitalist, and her archive of recordings documents the public’s taste (as well as her own) in programming in the 1920’s and 1930’s. There were many “pop” pieces that peppered her recordings recitals, detailing for me her love of pleasing her public. Curiously enough there are “song versions” of Granados’ Danza No. 5 and an Albéniz piano solo, which although dated, I think have a place and can please listeners nowadays. She also exposed songs in English in her charming accent, “Bring to me your coloured toys” by American composers John Carpenter. I began singing zarzuela concerts in NYC with Los amigos de la Zarzuela at NYC Cami Hall in the 90’s, and started acquiring Conchita’s repertoire; the UME anthologies by voice type of zarzuela “romances” was still years away from editing. I relied on Classical Vocal reprints to acquire “Fué mi mare la gitana” from La chavala by Moreno Torroba, “Lagarteranas” from El Huesped del Sevillano, “Canción de la gitana” from El mal de amores. All pretty obscure stuff (I don’t know any singers in Spain that program these pieces! ), and I really didn’t know any better. Conchita sang it, and that was good enough for me. I also got help finding these scores from Music Sales Ltd., they printed on demand old scores from the Union Musical Española catalog. I found a fascinating song that she recorded called “Loa al fandanguillo”. It wasn’t from a zarzuela that I could tell. Very andalusian, Conchita interpreted the song with much “desgarro”, and it was loads of fun to listen to; I replayed it many times. I started corresponding with María Luz Gonzalez at Archivo la SGAE in Madrid, and she popped a copy for me via regular post. De la serranía; Loa al fandanguillo: canción para contralto; versos de Manuel Machado; música de Modesto Romero. It also said: “Creación de Conchita Supervía”. This leads me to believe that the song was a co creation between Supervia, M. Machado and Modesto Romero. Too bad we couldn’t be a fly on the wall during those sessions, in which she coaxed out of those two, this fun vocal vehicle for her gifts and vocalism! The LP says “Fandanguillo de concierto”, a title that does not appear on the printed score I have. The entire piece is a stylized “lyric” version of a “cante jondo” song. There was great interest in Spanish folklore, flamenco and “cante jondo” from the composers, authors and painters at the turn of the 20th century, this piece I feel is a product of this aesthetic and interest. I was told that this song enjoyed a vogue on Spanish radio by a zarzuela fan by the name of Mrs. Fuertes in NYC, a charming lady that later became my friend, who told me she had heard the song on the radio as a child. Again, the piece might feel dated to a Spaniard, or at the very least nostalgic. I don’t know of other singers that have taken up this piece in modern days. I actually see it as good vehicle for collaboration with a classical Spanish dancer. I have performed “Loa al fandanguillo” three times in all these years; I bring it out once more at the 33rd annual gala of Los Amigos de la Zarzuela at Weill Recital Hall at Carnegie Hall this coming Sunday November 11, 2018 at 2 PM, with pianist Maxim Anikushin. I received an invitation from Spanish pianist Rosa Torres-Pardo to attend a private screening of a new film documentary about the composer Enrique “Enric” Granados (1867-1916) at the Juilliard School in New York City. The film is entitled “El amor y la muerte: Historia de Enrique Granados “ and is directed by Arantxa Aguirre. The screening took place on October 18, 2018, following a master class that Torres-Pardo imparted to several Juilliard piano students. The audience included several well known personalities from Spain’s classical music world such as former director of the Auditorio Nacional de España, Antonio Moral, conductor Rafael Lamas and composer Ricardo Llorca. Poster for the film “El amor y la muerte: Historia de Enrique Granados”. Being a great admirer of the work of Spanish film director Arantxa Aguirre since viewing her outstanding documentary, “Dancing Beethoven”, I was excited to be present at the preview screening of “El amor y la muerte” (translated as “Love and Death”). The title in Spanish really alludes to “Love” and “Death” as entities rather than abstract ideas (utilizing the male pronoun for “el” amor/love and the female pronoun for “la” muerte/death); the allusion for the title of the documentary is both the solo piano composition by Granados of the same title, as well as what is most certainly the inspiration for this composition, an engraving bearing the same title by the 18th century Spanish painter Francisco Goya y Lucientes, with whom Granados was obsessed with. I would like to add that the documentary’s theme is close to my own heart in many ways: in 2015 and 2016 I had the privilege to work as a performer on two multi disciplinary concerts about Enrique Granados’ time in New York City in 1916, for the Hispanic Society Museum & Library (NYC) and the Teatro “El Escorial” (Spain) with pianist Borja Mariño. Rosa Torres-Pardo was joint producer in this special film project, in which she was featured among other artists such as mezzo Nancy Fabiola Herrera, pianist Luis del Valle, violinist Ana Valderrama, pianist Joaquín Soriano in excerpted performances and conversations. On the screen we heard musicologists Walter Aaron Clarke and Miriam Perandones speak of their insights about the life of Granados. An interesting revisioning of Granados’ songs interpreted by notable flamenco artists filmed at the Teatro Real and the Prado Museum where other highlights of the film. Pianist Evegny Kissin and baritone Carlos Alvárez also make an appearance in the film with short performances. Pianist Rosa Torres-Pardo converses with pianist Joaquín Soriano in the film “El amor y la muerte”. I heard Rosa Torres-Pardo in a concert the previous week, which took place at the Bruno Walter Auditorium at Lincoln Center, in a program of Debussy and Albéniz. Presented jointly by the New York Opera Society and the Queen Sofía Institute, the concert took place on October 10 in celebration of Hispanic Heritage Day. She essayed sensitive renditions of Albéniz’s Iberia as well as the Suite Bergamasque by Debussy. Torre Pardo’s commitment to works by Enrique Granados is well documented throughout her career, notably so with her recent recording issued by Deutsche Grammaphon in 2016. Working with no film material at hand to illustrate the life of Granados, the documentary utilized historical photographs, and both original paintings created for this film, as well as period paintings (notably by Ramón Casas) which where in some instances animated, bringing to life early 20th century Madrid, Barcelona and New York City respectively. A movie still of “Amor y la muerte” of a photograph of Enrique Granados. Actors voices with quotes by musicologist Felipe Pedrell, painter and writer Santiago Rusiñol, cellist Pau Casals, novelist Gabriel Miró and poet Apelles Mestres, as well as text taken from letters by Granados to his wife were used extensively to bring the narration to life. Movie still of “Amor y la muerte” of an illustration of Enrique Granados and Pau Casals. The film highlighted the events of Granados’ stay in New York City, with its triumphs of numerous concerts, and the premiere of his opera “Goyescas”. It remains to this day the only opera presented at the Metropolitan Opera House in New York City by a Spanish composer. Pianist Rosa Torres-Pardo and mezzo Nancy Fabiola Herrera performing Granados’ “Maja dolorosa” in the film “El amor y la muerte”. The film move us inexorably to the “finale” of what we know as the tragic fate of this figure, and to what seems to be a senseless although predestined death intuited by both Granados and his wife. Using the leitmotif of the aforementioned solo piano piece by the composer, I felt as a viewer a profound sense of loss and sadness, as I witnessed on the screen visions of a vast sea, with which the film both begins and ends. A movie still of Enrique Granados and his wife Amparo in “El Amor y la muerte”. The film is a moving tribute to one of Spain’s greatest musical geniuses and will be a memorable treasure for lovers of Spanish music and for fans of the music of Enrique Granados. Pianist Rosa Torres Pardo and flamenco artist Arcángel performing a Granados song at the Museo Nacional del Prado in Madrid (Spain), with Goya paintings in the background, from the film “El amor y la muerte”. A recreation of Antonia Mercé’s premiere of “Danza de los ojos verdes” in 1916 was performed in the documentary by Spanish dance artist Patrícia Guerrero in the film “El amor y la muerte”. The film runs 79 minutes and was officially premiered on October 23, 2018 at the “Seminci of Valladolid” (Spain). I hope to announce soon the official viewing of this insightful and moving documentary here in the U.S.
“In his ‘charm offensive’ meant to assert his financial claims, Rossini did not forget the Queen: “Specially for Her Majesty Maria Cristina di Borbone, Catholic Queen of Spain, in Madrid on 20 February, 1831” he composed La passeggiata, which was published on 11 April, 1831 in the Spanish magazine «Cartas Españolas», later also by Ricordi. In Italian poetics the subtitle “Anacreontica” indicates a piece of poetry consisting of heptasyllabic or octosyllabic lines, dedicated to love, wine or joie de vivre. Rossini’s piece is not full of unbridled singing though but rather a contemplative ode to the beauty of nature. “La passeggiata – Anacreontica” must not be mistaken for “La passeggiata – Quartettino” from the “Album italiano” of his “Péchés de vieillesse”. However, the most important aspect of his trip to Spain is the “by-product” of the Stabat mater; which he had promised Manuel Fernández Varela, prelate and commissar of the Cruzada on the day before his departure (23 February, 1831). First Rossini went back on his word and he did not set himself to work before March 1832 after the clergyman had urged him. To finish this composition destined for Good Friday in time he felt compelled to appeal to his friend Giovanni Tadolini for help. Rossini entrusted him with nearly all the solo pieces and the closing fugue (7 numbers), while he took care of the other 6 numbers himself: all ensemble pieces and just one solo aria, namely the cavatina (No. 10) “Fac ut portem” for contralto, the singing voice he had always considered most important. Due to the quarantine because of cholera this thirteen-piece composition reached Madrid only after Good Friday 1832 and therefore was not premiered until the Good Friday of the following year, on 5 April, 1833 in the church of San Felipe El Real. When the Varela manuscript got to Paris in 1841 Rossini obstructed publication and substituted the seven pieces by Tadolini with four of his own; as a result “Fac ut portem” is number 8 in the version of the Stabat mater as we know it today”. Tile image: First edition of the Rossini Stabat mater; engraving of the church where the first version of the work was premiered San Felipe El Real in Madrid; portrait of Manuel Fernández Varela, Spanish cleric who commissioned the Stabat mater; portrait of mezzo Emma Albertozzi, first Italian mezzo interpreter of the Rossini Stabat mater. I got a second shot to revise my paper about the song “La maja de Goya” which forms part of the song cycle for voice and piano by Granados, Tonadillas al estilo antiguo (1913). I shared my findings from both old and new editions that help to understand why the performance practice of including the recited “melodrama” was lost, and presently point the way to give performers the option (or not) to include the recitation in modern day performances. My paper is aptly titled “¿Vestida or desnuda?”, since the original title of the song was “La maja desnuda”, a play on the title of the Picasso painting as well as presenting the option to include or not include the Periquet recited text. The set of 12 songs are almost never done in their entirety, as they include one song for baritone (usually sung by a female voice, “El majo olvidado”); a duet for two female voices which on rare occasions is sung as a solo song (“Las currutacas modestas”); “La Maja dolorosa I” which includes an obbligato for English horn; and the focus of my paper, the song “La maja de Goya” which has a recited section of text authored by the writer of the Tonadillas text Fernando Periquet (1873-1940); this particular song has the indication for the text to be declaimed over an instrumental piano and is traditionally omitted; now with new editions that are currently in print that include the entire text, there is now the option to restore the performance practice of inserting the declamation originally intended by both Periquet and Granados. Borja and myself had the opportunity at Hispanic Society in New York City in December of 2015 to do the entire Tonadillas al estilo antiguo with all its elements, with the participation of a soprano, baritone and English horn player in addition to myself. A recently published interpretative guide called Guía interpretativa Tonadillas en estilo antiguo by American pianist Mac McClure and Cuban Spanish mezzo soprano Marisa Martins, edited by Boileau in Barcelona is a great addition to the library of Spanish vocal music interpreters and enthusiasts. This edition includes the score as well as texts and CD of the cycle containing a recording of all texts, both spoken and sung (a thoughtful bonus is the inclusion of the IPA of all sung texts of the Tonadillas cycle); the CD includes the “La maja de Goya” recitation with the piano accompaniment. My paper dealt with restoring the context to bring about once more, the practice of doing the recited section of “La maja de Goya”. At the end of my talk, I projected the video of Borja and myself performing this piece at Hispanic Society, a concert that was part of the Granados Centennial Celebration year. As there was no obvious context to present a recital of songs by Granados that had a close relationship with the Granados’ opera María del Carmen (1898), I opted to make something old new again: due to my research that looked into the circumstances that gave way to the creation of the Tonadillas al estilo antiguo, I decided to program all the Tonadillas (minus “El majo olvidado”) in a concert that aimed to recreate the premiere of the cycle, make known those first interpreters that formed part of the premiere, as well as readings selected from excerpts from newspaper impressions about the event. Here is one of the newspaper clippings of the day, which called the event “La fiesta de la tonadilla”, which I adopted as the title of the concert in Murcia. The University of Murcia arranged the concert on October 19, 2017 at the Belle Époque setting of El Real Casino de Murcia, in a beautiful room with grand piano. To end the concert, we programmed a happy folk tune, “La canción de la zagalica”, taken from the opera María del Carmen, a gesture much appreciated not only by the conference organizers, but by the public due to its familiar tune and rhythms from the region. There was an impressive line up of world class scholars that deal with Enrique Granados in a multiple of aspects, from piano rolls, to dance, film, iconography as well as literary criticism. I unfortunately had to leave early and missed the exposition and debates moderated by the much admired Dr. Miriam Perendones, author of the epistolary of Enrique Granados, recently published by Boileau. I had posed several questions to Dr. Perendones such as: What were the circumstances of the creation of the Tonadillas? what was the nature of the collaboration between Periquet and Granados? Why did they embark on the project? what was the premiere like, how was it received? absolutely all my questions were answered in her doctoral thesis and papers that she very kindly provided me for my own study. We had a great showing at the Real Casino de Murcia, which is an elegant 19th century building that emulates the Alhambra from Granada. We had a full house for “La fiesta de la tonadilla” and the concert was received by an appreciative audience, always a gratifying experience for the performers! I whole heartedly congratulate the music department at the University of Murcia for helping to further knowledge on the life and works of Enrique Granados. Photo taken during the performance of “La fiesta de la Tonadilla” at the Real Casino de Murcia as well as a photo after the performance with pianist Borja Mariño, and the cover art for the concert. I have not sung many opera scenes with true basses. The last I did that comes to memory is the duet between Laura and Alvise in Ponchielli’s La Gioconda. There are more common encounters in baroque opera between these two voice types, as well as also in a couple of Bach cantatas that I have sung. There are occasions in which the mezzo interacts with the bass in recitative passages, but not often in large presentational duet like the one in Semiramide. The scene with Arsace and Assur in Act I of Semiramide begins with Arsace’s recit “…e questo Assur chi’io già detesto”. It would be a mistake to sum this scene as a big testosterone sable rattling scene. Its divided in four sections sections, and contains bridge section to mirror the power struggle and conflict (with what I call “emotional close ups”) between the two characters: a young dashing somewhat lovelorn general and a mature general that has been working many years to attain absolute power in ancient Babylon. The recit exposes the power struggle and rivalry between the two characters; Arsace ends his statement with scale with possible cadenza and begins the A section (Maestoso allegreto giusto) which then returns at the A tempo at the end of the scena. The Decca London 1965 recording cuts out the Andante section, which gives a great platform to show almost a soft side for Assur, wonderful expressive singing for Arsace, as well as beautiful cadenza in which both characters sing together, its a great moment. The “io tremar” of the Allegro vivace changes the mood in an aggressive way to bring us back to the A section, which in the uncut version repeats; its in this section that the ornaments are done. Musically and dramatically the scena is a mini opera, except that the conflict remains to be resolved (with deadly force) later on in the opera. Its a big chunk of music. 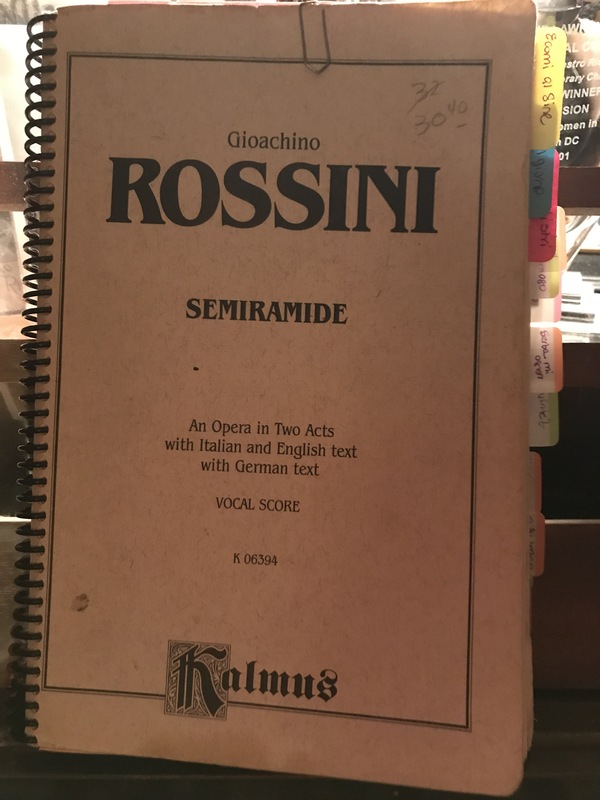 In the Kalmus score its 18 pages for this scena…for now I will learn the return of the A section come scritto (Horne re writes the passages leading to the end of this first exposition). It definitely needs a high note, as indicated by Rossini by the two fermatas. Not too worried getting this A section in my voice, as well as the gorgeous introspective cantilena section. The grouping of the figures in the last part of the duet are super trumpet like in character. I sung thru it a couple of times today. Tomorrow I will work on the possible ornaments and cadenzas for the duet. None are indicated in the Ricci cadenza book. After that, I’m moving on to the Act II cavatina of “In si barbara”. I’m skipping over the Act I finale quintet for now. I will sing thru a big chunk of this role in a small concert on September 6th in NYC so I can try all this out for size. Still working on that August 19th deadline to learn every note and every word! Maybe not every ornament and cadenza, but yes to be able to read the score from top to bottom. As I take myself thru the paces of learning Arsace, something I have been wanting to do for many years now, I’m getting into a good grove. Yesterday I reviewed the recits I had learned the day before, as well as making more inroads into my duet with Assur, which is extensive. I found it helpful to make a road map of what Act 1 looks like for Arsace, and that way lay out clear goals by day of what to learn and review. I’m hampered by not having a cut sheet, at this point I’m learning all the notes and passages. Without really knowing the overall architecture of the opera, it already reads to me as a masterpiece. The recitatives are very dramatic and theatrical; Rossini exposes the characters sometimes rapidly changing emotions and thoughts with sudden harmonic changes to allude to different emotional states. In this way it reminds of Handel’s craft in his opera Alcina. Rossini is always looking for coloratura passages that highlight the characters personality, that follow them as a sort of leimotif; I will find some examples and post. The recitative “Ecomi al fine” is a four page recitative that is preceded by a mini overture like prelude, that paints the sumptuous and mystery of the Babilonian temple that Arsace has gone for his secret appointment with the temple priests. A recent Naxos recording omits the recitative. So far Decca London Marilyn Horne disc with Sutherland and the live video on youtube with Lucia Valentini-Terrani are my favorite versions of this accompanied recitativo. This recit introduces the character and important information about the drama, in my opinion its a big mistake to cut it from the performance. So on day 2, I have gone thru the recitatives Ecomi al fine; Ministri; recitative preceding duet with Assur E questo Assur, ch’io gia lo detesto; duet with Assur has several sections, I have gone over the first two expositions. Uncut this duet could last 15 minutes at least. It seems like Rossini builds his scenas like Neoclassical architecture; I want to reach out to my friends at the Rossini Gesellschaft about this comparison! I found on youtube channel Addio bel passato has lovingly put Stigniani’s LP recital on line, and the Arsace aria that I fell in love (together with the recitative excerpted) can be heard. On this current hearing (after 20 years!) the tempo is slow to my modern ear and coloratura slightly labored. She is very spare on the chest notes. The album is dated 1953, so she had already clocked in several decades of singing professionally. There is still a bright and stentorian quality to the upper register, but the the bel canto contraltina ease is not there in this recording. Memory can play tricks, and I have plans to listen to the LP on YouTube. On to day 3! I will be going over sections of the first act with my pianist, so more later. Today I started my own 30 day challenge to learn all the notes (every melisma and every word!) of the role of Arsace from Rossini’s opera sería masterpiece, “Semiramide”. I spiral bounded my old Kalmus score which I have owned for many years. The Ricordi critical edition is available, but I’m putting off getting it until all notes and cadenzas are off the page. Today I learned the first three recitatives as well as the A section of the Arsace/ Assur duet, a confrontation of rivals. 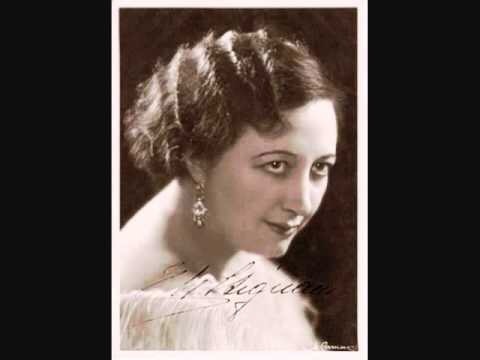 Many years ago I borrowed a long play vinyl of an Italian mezzo active in the 1930’s named Ebe Stignani. I managed to record it on a tape cassette and started listening. Side A was all light bel canto arias sung with great freshness and youthful tone. On side B Ms. Stignani transformed herself into a spinto/dramatic mezzo with arias from Samson et Delilah arias (sung in Italian of course), the letter aria from Werther as well as the meaty arias from Il Trovatore. On side A the aria “Ah quel giorno” from Rossini’s Semiramide caught my attention. I ordered the whole score (only way for me to excerpt this aria back then) and learned it pretty much by ear. I surprised my teacher Richard Torigi a bit when I brought it in, and he even said it wasn’t half bad…and so this aria sung by the character of Arsace became my first stab ever at music by who was to become my favorite composer, Gioachino Rossini. The next recording of this aria I started listening to was in one of Marilyn Horne’s Decca London recital albums. The aria became a sort of vocalise for me before auditions and concert; I never sang it in public until last year actually, at a couple of auditions. The duet with the character of Semiramide “Serbami ognor” I also started performing it publicly just this past year as part of concert called “Amor en Travesti”, with soprano Gloria Londoño at the Auditorio Nacional de España in Madrid. One of my operatic idols (flawed, human but divine nonetheless) is Italian mezzo Lucia Valentini-Terrani. I love her live and emotionally connected rendition of the aria on YouTube. The beginning recitative section of Arsace’s first aria is also stunning.